I recently had a small project where I decided to use pathlib combined with pandas to sort and manage thousands of files in a nested directory structure. Once it all clicked, I really appreciated the capabilities that pathlib provided and will definitely use it in projects going forward. That project is the inspiration for this post. In order to help others, I have created a pathlib cheat sheet that I hope will make it easier to use this great library. Later in this post, I include an example of building out a pandas DataFrame based on a directory structure. This is a useful tool for reviewing and analyzing a large number of files - especially on a Windows system where the breadth of shell tools is not readily available. The pathlib library is included in all versions of python >= 3.4. I recommend using the latest version of python in order to get access to all the latest updates. For this article, I will use python 3.6. Hmmm. That’s not complex but it is certainly not pretty. Let’s see what it looks like if we use the pathlib module. in_file_1 = Path.cwd() / "in" / "input.xlsx"
out_file_1 = Path.cwd() / "out" / "output.xlsx"
Interesting. In my opinion this is much easier to mentally parse. It’s a similar thought process to the os.path method of joining the current working directory (using Path.cwd() ) with the various subdirectories and file locations. It is much easier to follow because of the clever overriding of the / to build up a path in a more natural manner than chaining many os.path.joins together. This is a little clunkier in my opinion but still much better than the os.path.join madness above. The actual string representation is the same but the variable type is a pathlib.PosixPath The fact that the path is an object means we can do a lot of useful actions on the object. It’s also interesting that the path object “knows” it is on a Linux system (aka Posix) and internally represents it that way without the programmer having to tell it. The benefit is that the code will run the same on a Windows machine and that the underlying library will take care of (m)any Windows eccentricities. This example shows how to use a full string to create a path object. In this case, I am passing the full path to the USB drive. Let’s see what we can do with the p object. I think you’ll agree that it is pretty straightforward to use and interpret the results from this object. There are many other functions available through this API. Outside of interrogating the path in various manners, a very common need is to parse all the files and directories within a given directory. The python standard library has several methods to walk through all the files and subdirectories in a path. I will describe those next. The first approach I will cover is to use the os.scandir function to parse all the files and directories in a given path and build a list of all the directories and all the files. The key items to remember with this approach is that it does not automatically walk through any subdirectories and the returned items are DirEntry objects. This means that you manually need to convert them to Path objects if you need that functionality. If you need to parse through all the subdirectories, then you should use os.walk Here is an example that shows all the directories and files within the data_analysis folder. This approach does indeed walk through all the subdirectories and files but once again returns a str instead of a Path object. These two approaches allow a lot of manual control around how to access the individual directories and files. If you need a simpler approach, the path object includes some additional options for listing files and directories that are compact and useful. There is one quick note I wanted to pass on related to using glob. The syntax may look like a regular expression but it is actually a much more limited subset. A couple of useful resources are here and here. On the surface, it might not seem very beneficial to bring file and directory information into a pandas DataFrame. However, I have found it surprisingly useful to be able to take a complex directory structure and dump the contents into a pandas DataFrame. From the DataFrame, it is easy to format the results as Excel. Which in turn makes it very easy for non-technical users to identify missing files or do other analysis that might be difficult to automate. The other positive benefit is that you can use all the pandas string, numeric and datetime functions to more thoroughly analyze the file and directory structure data. I have done some looking and have not found a simpler way to get thousands of files into a formatted Excel file. 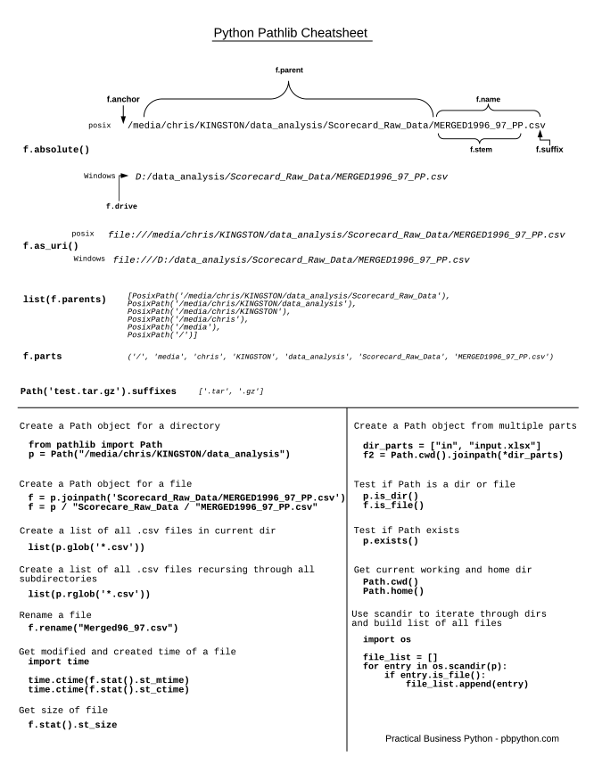 For this example, I will go through all the files in the data_analysis directory and build a DataFrame with the file name, parent path and modified time. This approach is easily extensible to any other information you might want to include. 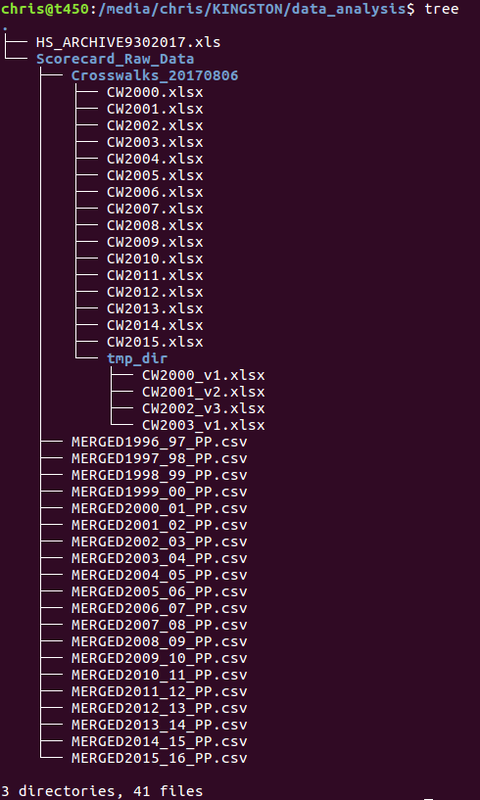 This code is relatively simple but is very powerful when you’re trying to get your bearings with a lot of data files. If the from_records creation does not make sense, please refer to my previous article on the topic. 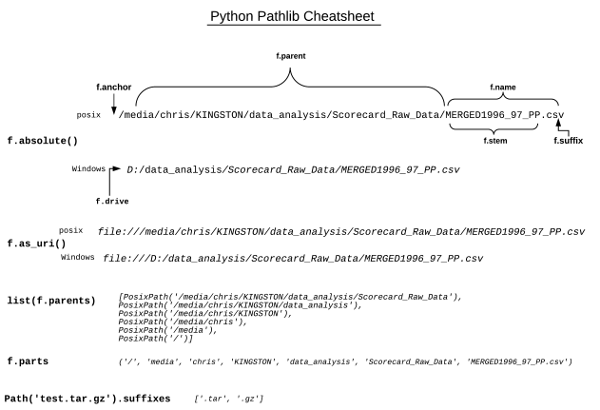 The pathlib module is very rich and provides a lot of other useful functionality. I recommend looking at the documentation on the python site as well as this excellent article on the Python 3 Module of the Week. Finally, since I find a visual reference useful, here is a pathlib cheatsheet I created based on this article. One of python’s strengths is that it continues to develop and grow over time. The pathlib module is a prime example of the care that the maintainers take to build new capabilities that improve the overall capabilities of python. There are many reasons to move to python 3 and I think pathlib should certainly be in the top 10 reasons. It is really useful to bring the standard library and a powerful package likes pandas together to accomplish some really useful tasks. I am quite happy with how useful a few lines of python can be when faced with cleaning up or dealing with thousands of files spread across many directories.